Save your hunger for the amazing Fish and Chips. Make it for lunch you will even savor the part of cooking, bet me! 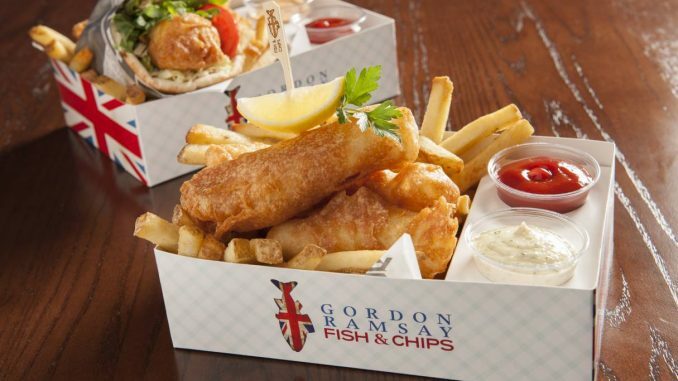 For Gordon Ramsay Group did next addition to the US collection of restaurants, Gordon Ramsay’s Fish & Chips. Well, Gordon is just gonna make his style and secret inhibited procedures to make the dish a boss as simple Fish and Chips. The takeaway-style British restaurant features Ramsay’s signature fish and chips, let’s find out how to make famous Gordon Ramsay Fish and Chips at home. In a separate medium-size mixing bowl, mix together flour, beer and egg; stir until the mixture is smooth. The secret is you let the mixture stand for a night to make it even crisper. Take the cod first season it with salt to remove the extra moisture and then put it in the flour with black pepper in it. Nicely coat them and then dust off excess flour and dip it in the batter. Pro Tip: You cut your fish even it is gonna cook evenly. Now just roll that and let it sink in the batter. Lay your Fish in there and fry until the fish is golden brown. Take it out and as it is crispier and steaming hot season it with some salt and move on to making fries. Pro Tip: Don’t wash the potatoes. Blanch the potatoes in the lesser heated oil (about 330 temperature) for 2 minutes. now cook them for the second time with higher temperature (rise to 385). The indicator for the fries are done is they rise up in the oil. Drain well on paper towels. Add some fresh parsley, paprika and a touch of some salt and pepper to it. Keep it aside. Now moving on to peas. Put a splash of oil in the pan. Put in some boiled peas, now a touch of salt, pepper, minced shallot and some garlic and a little knob of butter. Toss ’em. When evaporated turn off the gas and crush em a little bit add some more butter and some fresh mint. Stay tuned for more such ideas on your food and don’t forget to mention your experience with the Gordon Ramsay Fish and Chips in the comment section below.